The case of Freddie Gray has provided a long-awaited opportunity to put Baltimore’s legacy of police brutality on trial. But as the public weighs the facts surrounding the young man’s brutal death at the hands of police, the tragic backdrop to his short life plays out in a different courtroom: Baltimore’s “rent court,” where thousands of families like Freddie Gray’s are summoned every year to give up their homes. The city’s massive judicial eviction rate of roughly 6,000 to 7,000 rental households annually is among the nation’s highest, a product of the recession, along with decades of eroding housing stock and roiling social distress. 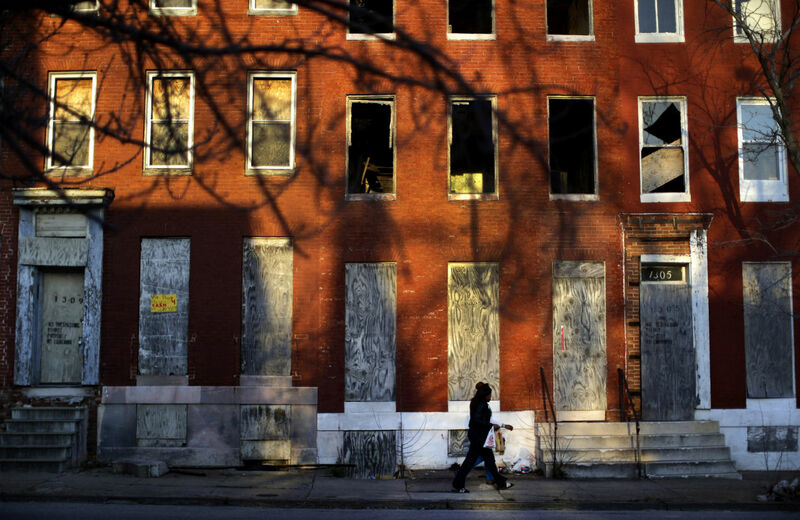 According to a new study by the civil legal aid group Public Justice Center (PJC), in collaboration with the Right to Housing Alliance and researchers at Johns Hopkins and the University of Baltimore, those who face eviction proceedings are casualties of an economic crisis that has metastasized into a constitutional crisis. A survey of about 300 cases processed through the rent court docket of Baltimore District Court shows that the structure of court proceedings leads many renters, who rarely have lawyers, to never even plead their case before a judge, and instead forgo their homes to avoid further legal trouble. About 94 percent of defendants are black, the vast majority women, and the targets of eviction were typically impoverished families with children, about half of them receiving public benefits for living expenses other than housing. The analysis shows the pool of about 300 defendants—sampled from some 150,000 cases processed annually—was steadily “whittled down” through “pre-trial hallway resolutions,” in which landlords’ agents or court personnel steer people toward hallway meetings to “settle.” These informal negotiations keep about a third of renters out of court and ultimately accelerate evictions. Most surveyed tenants experienced substandard housing conditions, including rodent infestation, leaking plumbing, or mold, though often the conditions were not cited in the court proceedings. In more than half the cases, tenants reported “peeling or flaking paint”—a potential cause of lead contamination, a particularly deadly scourge for Baltimoreans. An epidemic of lead poisoning has impacted the health of thousands of local children, precipitating a flood of lawsuits in recent years. One of those children, as The Washington Post reported in April, was one Freddie Gray. The analysis additionally revealed a general lack of consistency in judicial review and flimsy evidentiary standards for landlords. Researchers also observe that “year after year, between 50 and 60 percent of rent cases never result in a warrant,” meaning most cases are “resolved” without actual enforcement action. So landlords profit from wielding the mere threat of a lawsuit, perhaps because people rationally anticipate that the court is stacked against them. Another critical legal avenue for renters to address poor housing conditions, the escrow process (a court-brokered mandate on landlords), is similarly dysfunctional, according to researchers, marred by red tape and a prohibitively costly “pay-to-play” requirement that tenants deposit alleged back rent before their cases proceed. In most cases tenants were awarded either “no monetary relief at all” or a relatively small award compared to the amount landlords generally recovered. The court serves as a bureaucratic vehicle for this politics of displacement. From the city’s anti-poor housing policy to the courtroom mechanics, public institutions keep the poor teetering between homelessness and indecent housing that’s both unaffordable and unlivable. In the courtroom where officers will be tried for Freddie Gray’s death, attorneys will paint Baltimore’s poor enclaves as “lawless.” But in rent court, a different kind of law stalks Gray’s neighbors—a peculiar brand of civil justice that legalizes dispossession and criminalizes the poor.